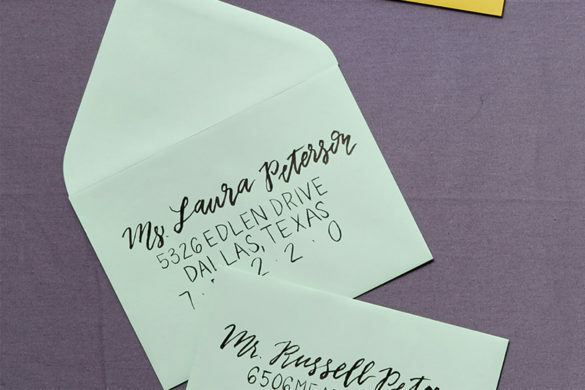 Alexandra Kretschmar from Ladybird Paper Co. gives us three calligraphed examples of some of the toughest addressing situations. Scroll through to see. First example: both members of the household are doctors. Second example: only one member of the household is a doctor. Third example: members are divorced and live at separate addresses. 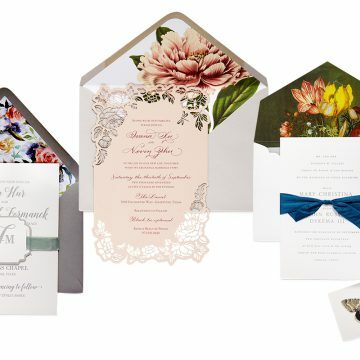 Need an invitation etiquette refresh? 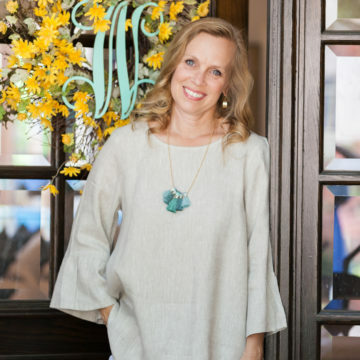 Melissa Wayte of Paper Affair helps us navigate the the dos and don’ts. When do you send the save the date? 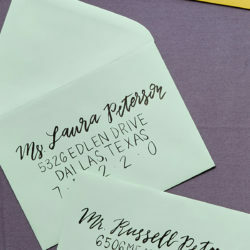 Mail save the dates at least six months before the wedding or earlier if it is a destination wedding. When do you send the invitation? You should mail them six to eight weeks in advance for a local wedding. If it is a destination wedding, eight to 10 weeks is proper etiquette. 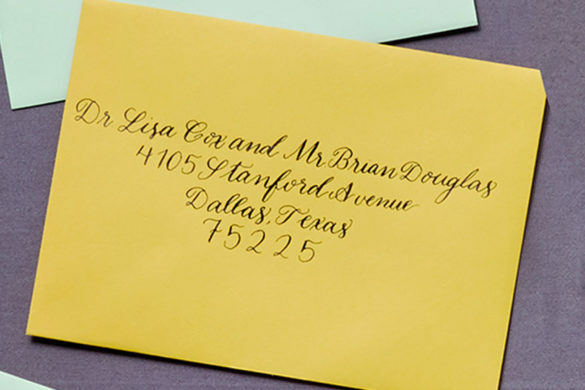 Ideally, your RSVP date should be about three weeks before the wedding. How do you follow up with people for RSVPs? I would recommend calling guests who have not sent you their RSVP about a week before your deadline for the caterer and venue. You can say you are calling to confirm receipt of the invitation and if you have the correct address. 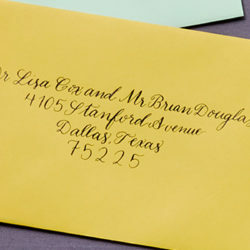 It is a good idea to still ask them to send the RSVP card via mail so you have all their information. How do you communicate whether someone gets a plus one? 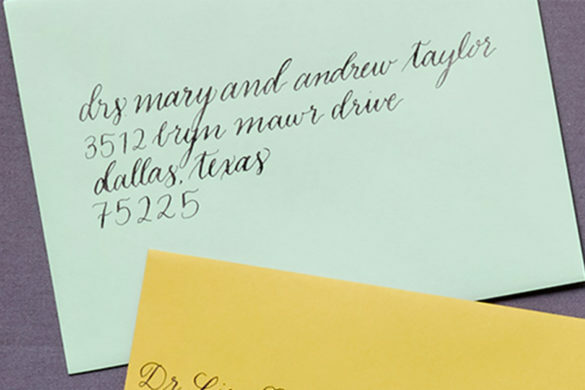 If using inner and outer envelopes, you should put “and guest” on the inner envelope. 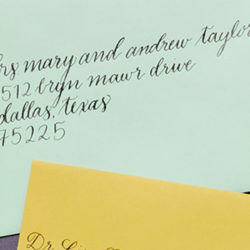 If not doing inner and outer envelope, the invitees should be listed on the outer envelope. If a guest tries to add someone, can you let them know not to bring them? Certainly! It is appropriate to call the guest and say that the number of people is limited and you were excited to be able to invite him or her. 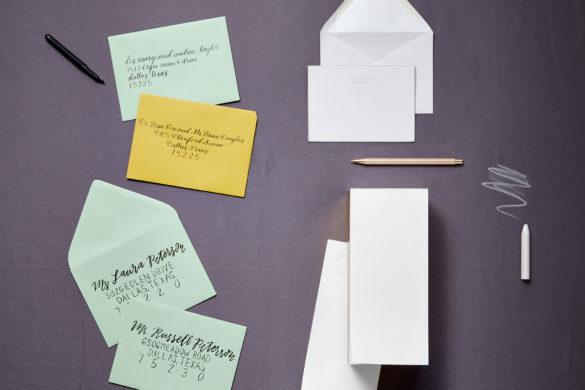 Are online invitations ever OK? No! 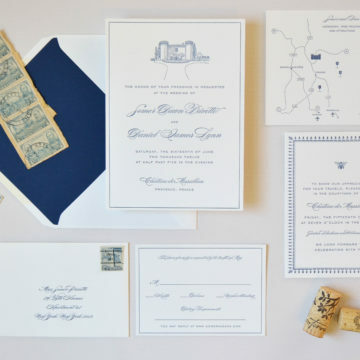 An invitation sets the tone for your wedding. Digital invites don’t have the same impact. 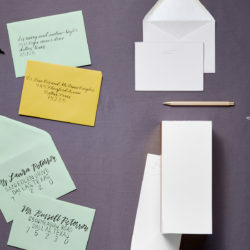 Mailing printed invitations the old-fashioned way is a tradition that I think all brides should uphold. How do you let guests know about the wedding website? Do not put an email or website information on the invitation. That information can go on a separate insert card.